Ranveer will next be seen in Gully Boy. Actor Ranveer Singh has mastered the art of winning hearts. This is known to all that he is a great fan of veteran actor Amitabh Bachchan. Thus, when the two bumped into each other, the result was their million dollar pictures that are sending the internet into a meltdown. Big B met the actor during the rehearsals for an event and he couldn’t resist himself from sharing about their meeting. 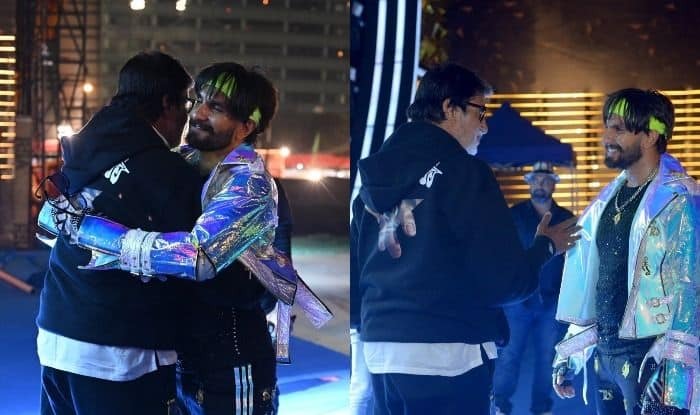 In the pictures, Ranveer can be seen tightly hugging Big B and we hope that some filmmaker plans to cast them together in a movie. T 3070 – On Republic Day .. a victory as surgical as any strike .. and a rehearsal for the event to collect funds for the families of the Police force in Mumbai and Maharashtra ..
Amitabh was last seen in 2018’s Thugs Of Hindostan with Aamir Khan and Katrina Kaif. The film couldn’t do wonders at the box office. He will be seen sharing the screen space with Alia Bhatt and Ranbir Kapoor in Ayan Mukerji’s Brahmastra. Ranveer, on the other hand, was last seen in Simmba. The film was directed by Rohit Shetty and even crossed Rs 200 crore mark at the box office. He is gearing up for the release of his upcoming film Gully Boy. The movie also features Alia Bhatt and is directed by Zoya Akhtar. It is all set to hit the screens on February 14. He has also started prepping for ’83 in which he will be seen playing the role of Kapil Dev.